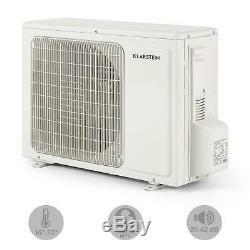 Klarstein Windwaker Pro 12 Inverter Split Air Conditioner 12000 BTU A++ White. 3.5 kW cooling capacity and 4.0 kW heating capacity with low fuel consumption. Desired temperature between 16 to 30 °C. 4-speed built-in fan with a oscillation function. 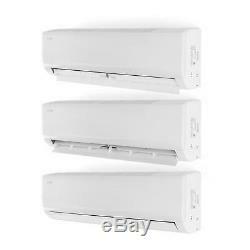 Refreshing split air conditioner for the regulation of indoor climates. Powerful 12,000 BTU / 3.5 kW cooling capacity and 4.0 kW heating capacity with low fuel consumption with an energy efficiency class of A+. Desired temperature selected in 1 °C increments between 16 to 30 °C. 4-speed built-in fan with a oscillation function for better air circulation. Included remote control for convenient control. On/off switch on the remote control. Split air-conditioner for temperature regulation, including input and output lines. Operation light on the device display. 5 operation modes: auto, cooling, heating, drying, and fan. Auto mode: the device independently chooses all settings for providing a pleasant climate in the room. Cooling mode: standard operation for the cooling of rooms to a temperature between 16 to 30 ° C. Heating mode: standard operation for the heating of rooms to a temperature between 16 to 30 ° C.
Drying mode: lowers the humidity with up to 1.4 l/h. Fan mode: separate operation of the fans without cooling capacity. 4 fan settings: low, medium, high, auto (device adjusts to the air circulation of the room temperature). 2 timer modes: shutdown timer & power-up timer. Timer adjustable to concrete times in 1 or 10 minute increments. Sleep mode: automatic raising or lowering of the temperature for optimum sleeping conditions. Controlled via a remote control. Temperature displayed in either °C or °F. Device power supply: 220-240V / 50-60Hz. 80 x 54.5 x 30 cm (WxHxD). 84 x 27.5 x 19 cm (WxHxD). 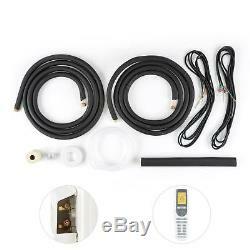 Length of the included copper pipes: 4 m. 1 x inlet/outlet set including mounting materials. User manual in German (other languages: English). Extremely economical spit air condition for cooling, heating, and dehumidifying all types of indoor rooms with an A++ energy efficiency class. 5 selectable operating modes: automatic, cooling, drying, fan, and heating for comfortable temperatures between 16 und 30 °C. Highly noiseless indoor unit with 30 dB(A), up to 600 m³/ h air flow and 1.4 l/h dehumidification. Comfortable room temperature are no longer a myth. The Klarstein Windwaker Pro 12 split air condition all year long fills your home or office with fresh air, provides a pleasant level of humidity, and grants amiable room temperatures. No matter what the weather outside is, with the Klarstein Windwaker Pro 12 air condition you will always have complete control over the temperature indoors. It doesn't matter whether cooling, heating, providing fresh air, or dehumidifying is needed, the split unit is equipped for all situations in order to achieve the desired temperature between 16 to 30 °C. This luxury doesn't have to expensive. With the heating or cooling mode, the fan with its oscillation function and its 3 speeds and the various timer functions, you can customize the device to perfectly fit your needs. All this is controlled from the comfort of the couch or desk with the included remote control. Through the two unit principle, everything runs with an extremely quiet operating noise level. 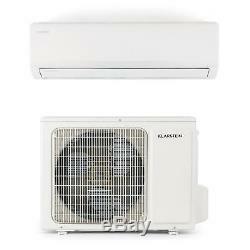 The Klarstein Windwaker Pro 12 split air conditioner creates dream climates. It will always provide you with the best indoor environment. It is the air professional! Model identifier of the supplier: 10029707. Sound power level indoors in the cooling mode in dB: 54 dB(A). Sound power level outdoors in the cooling mode in dB: 63 dB(A). Sound power level indoors in the heating mode in dB: 54 dB(A). Sound power level outdoors in the heating mode in dB: 63 dB(A). The leakage of the refrigeration (R410A) contributes to climate change. Refrigerants with a lower greenhouse potential contribute less to global warming in the event of a spill than those with a higher greenhouse potential. This device contains with a global warming potential of 2088. Thus a leakage of 1 kg of this refrigerant has a greater impact on global warming, specifically 2088 times more, than 1 kg of CO2, over a period of a 100 years. Do not carry out any work on the refrigerant circuit or dismantling of the unit. Always consult a specialized technician. Coefficient of performance in cooling mode (SEER): 6.1. Energy consumption 201 kWh/year, based on the standard test results. The actual consumption depends on the usage and location of the device. Design cooling load in kW: 3.5 kW. Coefficient of performance in heating mode. 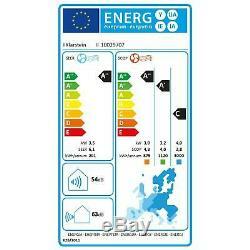 Energy consumption 875/1120/3000 kWh/year, based on the standard test results. Other heating seasons ('warmer' and'colder'). Design heating load in kW: 4.8/4.0/2.8 kW. Specified performance capability and the calculation of the SCOP under the reference design conditions underlying replacement heating power: 0.6/0.2/1.1 kW. Further information, see product data sheet. Please consider that according to the EU F-Gas Regulation 517/214 you require certificated companies and technicians for the installation and maintenance of air conditioning units. The item "B-Stock Air Conditioner Split Conditioning Unit 12000BTU A++ Inverter Climate" is in sale since Sunday, March 17, 2019. 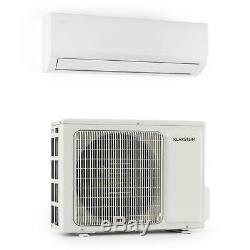 This item is in the category "Home, Furniture & DIY\Heating, Cooling & Air\Air Conditioners & Heaters\Central Air Conditioners". The seller is "hifi-tower-deals" and is located in Germany +.